At the NAMM, Roland has released a new Tone Capsule for its Blues Cube amps, and introduced a new amp: the Blues Cube Hot. 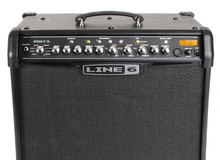 Line 6 introduces a new compact combo in their AMPLIFi range. Vox unveiled a new series of modeling combos for guitar, with two compact and affordable amps. Roland completes its Blues Cube series of guitar amps with the Artist 212 combo and the Tour head, both equipped with the Tube Logic technology. Vox will offer this year a very limited edition of its VT20+ modeling combo for guitar in a special Classic finish. Roland and Eric Johnson reworked the Blues Cube guitar combo so that they can receive the new Tone Capsule modification circuit. We’ll finish this first day of NAMM with the presentation of the new Blackstar ID:Core Beam guitar and bass combo with Bluetooth.